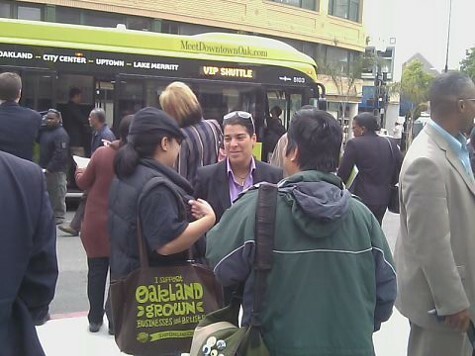 A gaggle of beaming representatives from the City of Oakland, AC Transit, the Bay Area Air Quality Management District, and local business coalitions gathered on Franklin and 22nd Streets in downtown Oakland this morning to officially launch the new, free Broadway shuttle system — or, “The B,” as they’re calling it. Officials hope The B will spur economic development in the various downtown Oakland districts that run along Broadway. 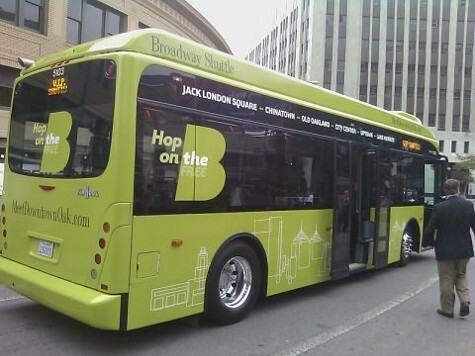 The four redesigned, freshly green-painted buses that comprise The B will travel up and down Broadway from 7 a.m. to 7 p.m. on weekdays and link Jack London Square with Old Oakland, Chinatown, City Center, Uptown, and the Lake Merritt area. The B, which will be operated by AC Transit drivers and has been running for a couple weeks already, provides easy access to Broadway’s numerous restaurants and Oakland’s recreational waterfront attractions. 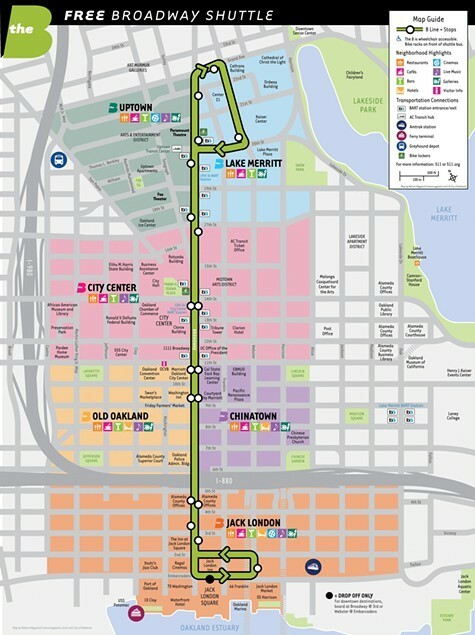 It also represents a green, free, and direct route to Jack London Square and downtown workplaces for commuters who use BART, the ferry, and Amtrak to get into the city, said Oakland Redevelopment Director Gregory Hunter. The B runs from 7 a.m. to 7 p.m. weekdays. The B is the result of what project manager Zach Seal called “a very robust public-private partnership.” Key players were the Oakland Redevelopment Agency, business associations in Jack London Square and Lake Merritt, and most importantly the air district, which awarded Oakland a $1 million competitive grant to be spent on The B’s operation over the next two years, according to Damian Breen, the air district’s director of strategic incentives. The B will remove more than 350 vehicles from downtown Oakland’s streets and reduce five tons of greenhouse gases per year, Breen said. It took just nine months for the project to go from the drawing board to the streets. “That’s very quick by governmental standards,” noted Councilwoman Rebecca Kaplan, a longtime former AC Transit board member whom others called a cheerleader for the project since Day One. Kaplan helped spearhead the creation of The B.